Fénix Imvico introduces one of its latest novelties in kiosk printers. It is the TK55PR printer, high performance with Presenter function. It is a next-generation printer, specially designed for professional use. Among the advantages of this new printer, it highlights its functionality to fit in limited spaces and its loop type presenter function without paper jams, which guarantees a safe delivery of any type of receipt or tickets in all those applications addressed to the public. Three different adjustable paper roll holders, which help to fit the printer into the most limited spaces. High quality 1D and 2D barcode printing. Loading logos, firmware upgrades and support for Windows and Linux. 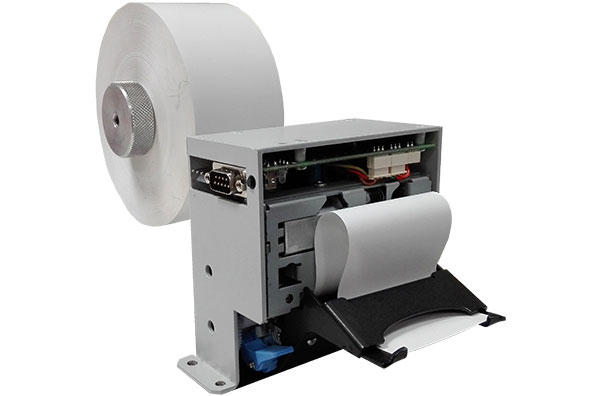 It is an ideal printer for unattended terminals, POI and vending and auto-pay machines. Why are kiosk printers necessary? Mostly their function is the printing of tickets or receipts as proof of any transaction made from a kiosk system, and for the use of that information to be properly cared for, it is necessary the use of kiosk printers, which process that information and delivers it in paper format for each application. At Fenix Imvico we always seek to offer you an ideal solution, whatever the required need is. We design and manufacture a wide range of printers that cover most of the needs of the different markets. Should you need additional information about our products or services, do not hesitate to contact us.